Product code: W1199 Categories: Antique, Antique Clocks. 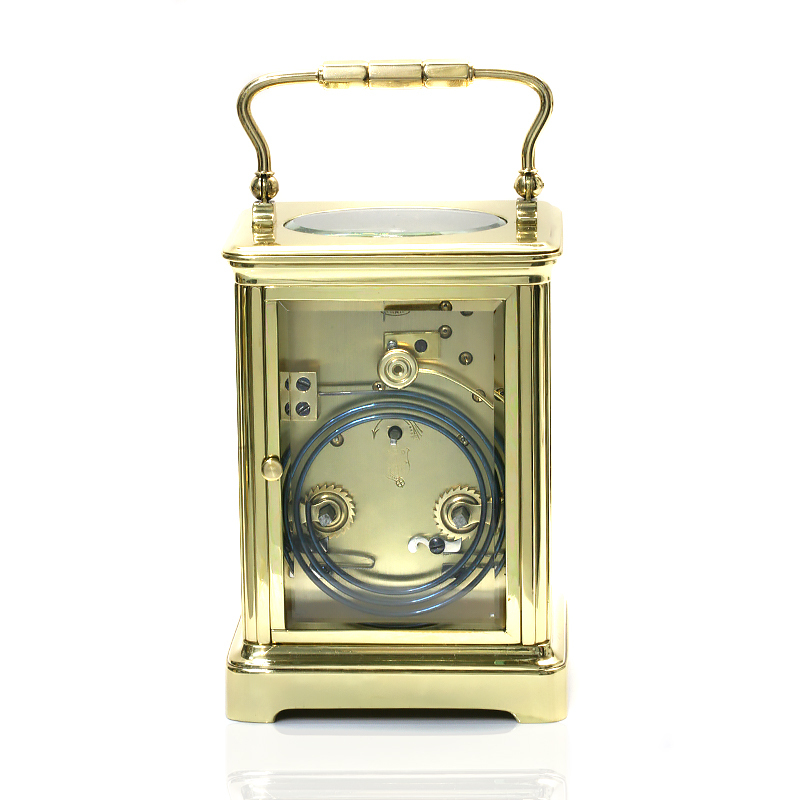 Perfect for any room in the house, this Antique time and strike carriage clock by Couaillet will not only look so beautiful in the room but sound just as sweet. Made in the late 18oo’s by the Swiss company Couaillet, both the case and the movement has been extensively restored and is in full working order. The dial is all original with the stylish black Roman numerals on the white dial, and this clock will strike every time it reaches the half hour mark as well as on the hour with the most beautiful tone. 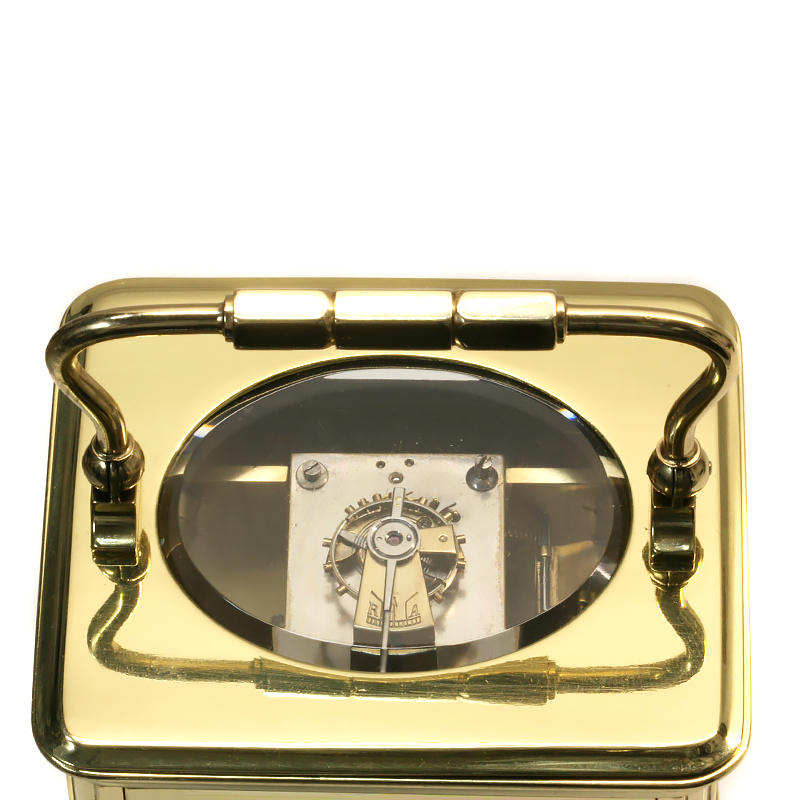 Measuring 13.5cm tall or 17cm with the handle up, by 9.5cm wide by 8cm deep, carriage clocks such as this have the wonderful feature of glass panels to see the gorgeous movement inside. This antique carriage clock is over 120 years old and now looks as stylish today as when it was made all those years ago. Carriage clocks are also known as “Officer’s clocks” and was developed in France in the early 19th century by the famous and arguably the most important and influential clock maker, Abraham-Louis Breguet. 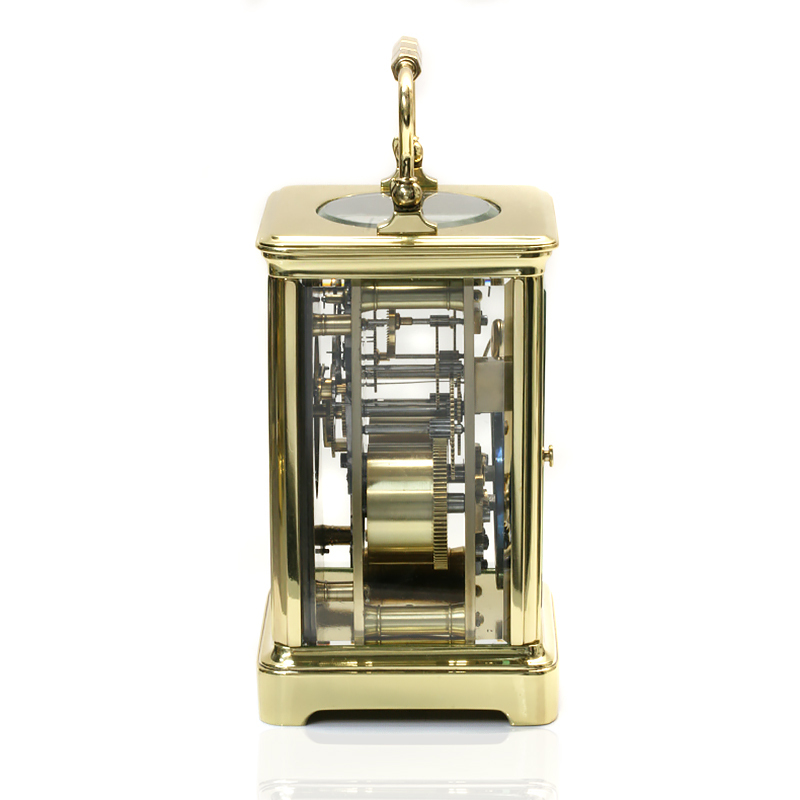 Story has it that they were originally designed for the Emperor Napoleon in 1812, and what makes carriage clocks different to other clocks especially at that time, is that they held a spring driven movement within its casing allowing them to be easily transported. The robust nature of the design gave carriage clocks a new level of practicality, as they were portable all the while keeping their accuracy. Carriage clocks often have decorative handles and either porcelain, enamel or glass panels, and when glass allows viewing of the movements within. The handles were not just there for aesthetics, as they were an important feature of the clock, making them suitable for transporting around outside the house. Often fitted in brass cases which once restored brings them back to their former glory, the glass often had beveled edges giving it a further attractive look and style to it. The carriage clock was designed specifically to meet the need for a more portable and durable clock, which wouldn’t be damaged while being moved and taken quite literally in carriages that were rolling over cobblestone roads. These clock were built to last and have stood the test of time, with many examples still remaining in wonderful condition today. Just as popular today as when they were made, carriage clocks have that unique ability over other antique clocks of being able to fit into any room thanks to a style and design that doesn’t give it a dated look or feel to it.